Have a Great Spring Break! 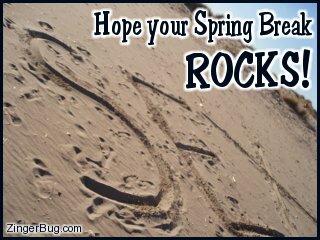 Celebrate spring break with these comments, photographs, drawings and graphics designed for posting on social networking web page or blog. Spring break means parties, fun and one last fling with all of your school friends before summer. So whether you're headed to the beach, or the slopes, or just taking a much needed vacation, do it in style!